Andrew Falzon has gone from a near-vegetative state to weightlifting and a brisk, 90-minute walk each day. In his first off-medication interview, he says he wants to raise awareness on depression – another struggle he faced due to Parkinson’s disease. Parkinson’s robbed Andrew Falzon of his mobility and speech at age 22, but he is getting it all back after a groundbreaking surgery and a big dose of determination. “Parkinson’s robbed me of almost all that I loved: I was very athletic and adventurous, always out and about. I went from riding motorbikes, hiking for hours and teaching martial arts to spending hours staring into space,” the 39-year-old says as he lets his dog, Aki, off the leash. 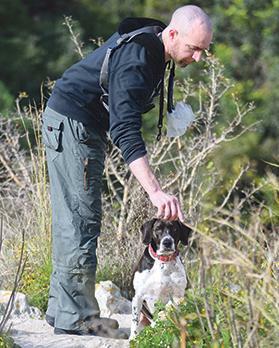 Curiosity and the smell of some small animal is enough to set Aki off across the Mosta valley. For Mr Falzon, the driving force is his “great love for life”, he says, as I try to keep up with his pace on one of his daily 90-minute walks. It is hard to believe just seven years ago, the young man trotting along the uneven, at times slippery, path down the valley was nearly in a vegetative state – or as he calls it “a sack of potatoes”. As we slow down and wait for the photographer accompanying us to catch his breath, he says his joie de vivre may have flickered, but did not go out when he was at his lowest after depression dug its roots around him. Just like rigidity and tremors, depression is, for some, a real clinical symptom of Parkinson’s, brought about by changes in brain chemistry. When he started slipping into depression three years ago, as a precaution he removed some training ropes that hung from his pull-up bar. He knew that depression was “the biggest liar: it tells you that life is hopeless”. “There is nothing worse in the world than depression. It is worse than Parkinson’s itself,” Mr Falzon said, noting that he is still overcoming it. Apart from the anti-depressants that he was prescribed, he believes that having a vision is a constant motivator – in a year’s time he sees himself faster, stronger and more flexible. The former PE teacher realised he had Parkinson’s symptoms at 22 and was diagnosed at 24. At age 27 he had to give up his job. Initially medication helped, but his condition kept worsening. Eating had become a task of ingesting protein, and he would just grab the plate and shovel everything into his mouth, as the debilitating tremors prohibited him from taking measured bites. It would take him 45 minutes to reach the bathroom on his own, and at night he would call his younger brother to drag him across the floor to get there. At times he was not able to speak or make any facial expressions whatsoever, he says, smiling broadly and raising his eyebrows to illustrate the point. Then it all changed in 2011 when, at 33, he became one of the first five patients to undergo a groundbreaking surgical procedure at Mater Dei Hospital known as deep brain stimulation (DBS). DBS is similar to implanting a heart pacemaker, except that the electrodes are placed deep within the brain and connected to a neurostimulator – approximately the size of a stopwatch. Aki accompanies Mr Falzon on his daily, 90-minute walk. The electrodes in the brain connect to wires that pass under the skin and lead to the ‘pacemaker’ – the neurostimulator implanted on the chest wall. The computer inside it allows doctors to block abnormal signals in the brain and treat common Parkinson’s symptoms – tremors, rigidity, stiffness, slowness and problems walking. DBS does not provide a cure but can provide significant improvements in symptoms. When he spoke to The Sunday Times of Malta in 2011, Ludvic Zrinzo, Associate Professor and Consultant in Neurosurgery at UCL and the National Hospital for Neurology and Neurosurgery in London, said DBS was the “closest thing to magic” he had ever seen. Mr Zrinzo’s research improved the surgical technique of DBS for Parkinson’s and included pioneering work through DBS for Tourette’s syndrome, cluster headaches and obsessive compulsive disorder. As visiting consultant neurosurgeon at Mater Dei, Mr Zrinzo introduced DBS to Malta in 2011, such that patients no longer needed to go abroad for the surgery. In Malta he works closely with consultant Neurologist Josanne Aquilina. The surgery requires meticulous organisation and close collaboration between neurosurgeon, neurologist, radiology services, theatre and ward staff. The Maltese DBS team has presented the results of the first five years of the local DBS service at several international congresses, and they rank among the best in the published literature. Mr Falzon has topped up the surgery with physical exercise, a healthy diet and several litres of water a day, among other things. He did not just rely on others, but took it upon himself to push his boundaries. He used to suffer the side effects of medication, such as hallucinations and paranoia. Only a few months ago he wrestled with death and spent three days at the intensive therapy unit after he delayed replacing the batteries in his neurostimulator and they lost their charge. His ultimate goal is to turn the electrodes in his brain into two shiny rings, which he imagines wearing on his middle and forefingers while making the victory sign and smiling at the camera. Mr Falzon has not set any time frame for his progress, but tries to do the best he can every day. The next time we meet, he promises he will walk down into the valley backwards.